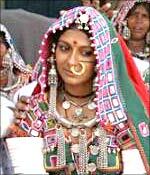 The Lambada community has been part of the landscape of Hyderabad and parts of Andhra Pradesh. Dressed in their colourful attire and chunky jewellery, the Lambada women are often seen toiling as daily wage labourers in construction sites. Their shanties are usually seen close to the areas they work in. It is their craft of embroidery, which has caught the urban eye. The mirrors and stitches are now moving into the realm of haute couture though in a new avatar. Lambadas live in abject poverty, and have not featured much on celluloid. K N T Sastry makes an attempt to capture them and their way of life in the Telugu film Kamli, My Daughter. The film portrays the grim reality of their struggle in life. A takeoff from a documentary, Harvesting Baby Girls, Sastry made some years ago when the adoption scandal hit Hyderabad, Kamli tackles the issues of the sale of the girl child (rampant in the community) and the swapping of the male child -- a practice fairly common in the urban areas -- particularly in the hospitals. Kamli (played by Nandita Das) is the focal point of the tale. She is forced to sell her firstborn girl. It is a well-known fact that the girl child is not welcome in most Indian communities and amongst the Lambadas she is considered an ill omen. The boys are wanted as they feed their parents. One gets a peek into her life -- how she is married to Redya (played by Shafi), her toil for a job, how she puts up with an alcoholic husband, how she faces the 'contractors' and other men folk who have lecherous designs on her and so on. When she delivers a male child, her infant is swapped and a girl child is placed instead. This incident forces her to fight for her son. The media's role (in the building of hype of Kamli's fight), her dharna and the subsequent outcome with some melodrama are portrayed in a stereotypical manner. The film has a few plus points. It is a realistic portrayal of the Lambadas and their conditions -- the squalor and poverty comes through well. Redya exemplifies the Lambada man, who spends most of his time drinking liquor, while the women have to toil to run the house. Nandita Das and Shafi are convincing in their portrayals and live their roles. Nandita is brilliant in a few scenes where she fights with Shafi. Tanikella Bharani does a good job too. Using the Lambada ballad singers and most of the Lambada community itself and shooting them in their environment lends the required authenticity. Music score by Issac Thomas Kottukapally enhances the film and the lyrics are meaningful. The film looks at a very relevant issue but somehow the narrative is simplistic and straight forward. The film goes back and forth in time with flashbacks. The melodrama element is not reduced in the flashbacks. The characters are just a few and the Lambada community at large is not dealt with. Perhaps the inter-personal relations among the community and better fleshing out of the characters would have added more depth. The only relationship Kamli shares is with Badya (Bharani) and his wife. Barring a wedding scene where one gets a glimpse of the wedding ritual, there is not much focus on the other customs and traditions. Also a better build-up of the central idea and an exploration of the reasons for the sale of girls and the racket of adoption could have been tackled in more detail. But on the whole, Sastry's effort is laudable in bringing out the Lambadas' grim reality.